Three photos in this post. Our day started at White Water. I was expecting huge crowds and truly not looking forward to it BUT one of the Caleb’s friends was having a birthday and so we were invited to join them. White Water (a water park here in Branson) was SO quiet when we arrived I wondered if it was open. Our first stop was the Wave Pool and there was hardly anyone in it! The kids had a blast pairing up in 2’s and enjoying the rides etc. Although it busied up later, it still was not too bad. After lunch it was time to go to The Mill. I honestly wasn’t feeling that creative and didn’t want to start a new project late on a Saturday afternoon. Okay, I’ll admit I have several projects on the go but wasn’t in the mood to get really creative with any of them! Not only that I needed to cut some letters to finish one of my projects. Although most of the time the big letters work for a project there are times when I need some small letters. Those have to be cut out of photo pieces. 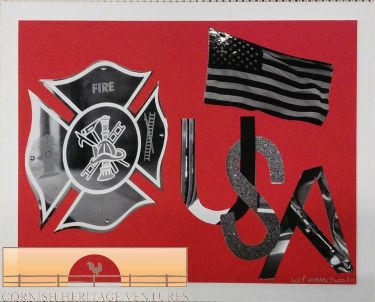 I was in need of “U” and “S” for a small USA like in this Fire collage so, with the templates already made I started marking and cutting. 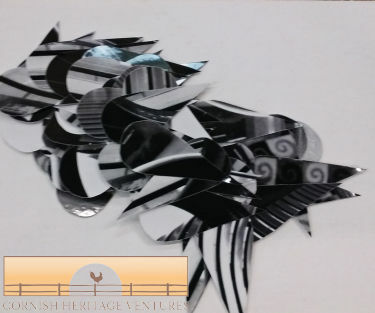 As I was cutting an “S” inspiration suddenly flooded me as I saw a petal in the discarded/cut bits. Bear in mind that I had cut this S several times before but never seen it. However I am noticing that the more letters I cut, the more I am seeing. I try to critique each off-cut to ensure I am not missing any gems. I was SO excited to see the petal thinking that I could make unique flowers. (No petal is exactly the same and with each flower having multiple petals, they definitely will all be different.) A customer came along whilst I was cutting, asking what I was doing. When I explained she started to play with the petals. Now, how many of you know that fingerprints easily transfer on to glossy photos?! (I always wear gloves when working with the photos.) I was cringing inside as this sweet lady put her fingerprints flat on the petals BUT she shared her inspiration and created this gorgeous heart. (I wiped the fingerprints off later.) 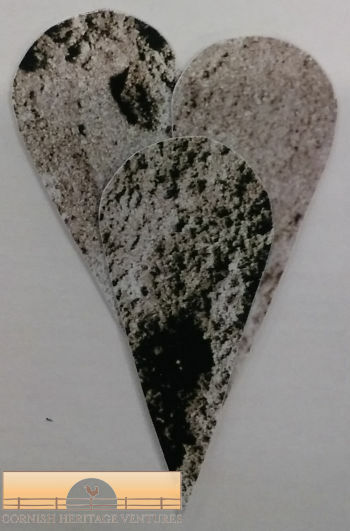 Yes, these petals were made from a sand photo. SO cool, even if I do say so myself. When people come by the booth, I always tell them that their imagination is truly the limit to what they can create or ask us to create. That’s true for me also. My imagination is definitely growing the more I work with this art.